Secretary of state nominee Rex Tillerson answers questions during his confirmation hearing before the Senate Foreign Relations Committee. Washington – Sen. Chris Murphy, who says the nomination is in trouble, on Wednesday questioned secretary of state nominee Rex Tillerson about a dossier of unverified allegations that Russian operatives have been helping President-elect Donald Trump for years and have compromising information about him. Tillerson, 64, a longtime contributor to Republican candidates and former CEO of ExxonMobil, said he had not been briefed on the report and did not know if Trump had been. 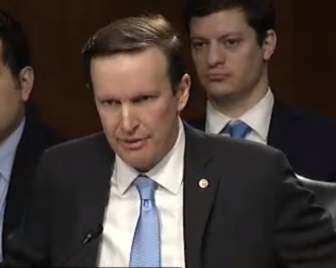 Murphy, a member of the Senate Foreign Relations Committee, pressed on at the panel’s confirmation hearing. He asked if Tillerson or Exxon had ever had “any dealings” with former Trump campaign manager Paul Manafort or Carter Page, a former Trump adviser. The unverified dossier describes dealings between Manafort and Page and the Russian government. “Not that I know of,” Tillerson said. The dossier is believed to have been written by a former member of the British intelligence community, and contains unverified allegations that Russian operatives have been “cultivating, supporting and assisting” Trump for years and have compromising information about him. It includes allegations that Trump advisers met with high-level Russian officials in the months before the election. U.S. officials reportedly included a two-page summary of the dossier in classified briefings to President Obama and, separately, to Trump last week. The president-elect, however, did not answer when asked if his advisors had met with Russian officials before the election. The dossier is expected to be discussed when Murphy and his fellow senators are briefed by officials of the FBI and other intelligence agencies Thursday evening. Murphy also asked the nominee about a Trump tweet about North Korea. Tillerson said he did not know what Trump meant with his tweet, whether it meant the United States would stop North Korea or whether the communist nation was incapable of creating an intercontinental ballistic missile. “When you conduct foreign policy by 140 characters, it does get pretty opaque,” Murphy said. Murphy also asked Tillerson about earlier testimony in which the nominee declined to endorse a bill that would punish all nations that launched a cyberattack on the United States. Tillerson said the president ought to have the “flexibility” to respond to cyberattacks on a “case-by-case” basis. Murphy also said he was concerned about Tillerson’s position on human rights and pressed him on Exxon’s business dealings with nations hostile to the United States, especially Iran, Syria and Sudan. 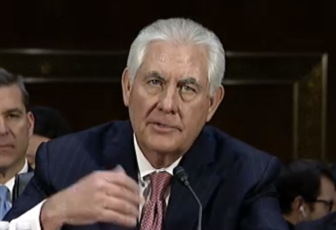 Tillerson said the guidelines Exxon used in doing business with foreign companies were “is it legal?” and would the nation in question honor a contract and operate under the rule of law. In an interview, Murphy said he rejects Tillerson’s guidelines. “I believe there’s something called business ethics, and I think it’s a disaster that when Tillerson had a choice between U.S. security interests and Exxon profits, he chose Exxon profits all the time,” Murphy said. Sen. Chris Murphy questions secretary of state nominee Rex Tillerson. Murphy said he will vote against Tillerson’s candidacy and believed some Republicans on the committee might too, dooming the nomination. “I just don’t know how a Republican can vote for him,” Murphy said. The GOP has a narrow, 11-10 majority on the Foreign Relations panel and it would take one Republican defection – if all Democrats voted against the candidate – to reject the nomination and keep it from a confirmation vote by the full Senate. On Tuesday, Sen. Marco Rubio, R-Fla., got into an animated exchange with the nominee and said some of Tillerson’s answers about Russia were “troubling.” Pressed by Rubio, Tillerson refused to call Russian president Vladimir Putin a war criminal. Tillerson broke with Trump on trade issues, saying he supports the Trans-Pacific Partnership. He also denounced Russia for meddling in U.S. elections and distanced himself from Trump’s call for a ban on Muslims, and from a registry of American Muslims, and from Trump’s characterization of Mexicans as rapists and criminals. “I would never characterize any population with a single term,” Tillerson said.